And that's that from Turf Moor! We shall see you tomorrow for more Champions League gold. More from Sean Dyche: "It's been an interesting five years and we are still going. It was a tough affair but the end result was what we were all after. "I thought it would be a tight affair. We had to find a balance against their counter-attack. They are a good side. "The goal encapsulated how quick we can press on a turnover of play. Jeff Hendrick was very composed, it was an awkward one and a great finish. "We stay focused on the next game. It's a way that works with the team. We never take anything for granted. I don't need to look at the table, people tell you often enough." More from Rafa Benitez: "Really disappointed. It was a game that could be a draw or one goal from either side. I think we had the game under control. We conceded and we lost. "It was a pity when they scored. In our head we had the substitutes ready and we had to do things quicker. I think we could have drawn or won with a bit of luck. "We have some good things but sometimes we are missing being more precise on the ball and being more clinical." Burnley boss Sean Dyche on Sky Sports: "Very pleased. I said before I'd be surprised if it wasn't a tight game, they have a quality manager who knows how to organise a side. "It's respect to our team when sides come here and are organised and try not to be too expansive. "We tried to mix our play and stay calm on the ball. You still have to probe and find a way of winning a game and we've done that tonight. "It's always good to have a plan on a piece of paper and it doesn't always pan out as you planned it, tonight it did. They had some good chances and we had to counteract that. "It's a very strong start to the season. People have talked about home form but that was written off tonight." On where he takes Burnley from here: "We just keep getting on with it, that's my focus and my team's focus. Generally we take each game as it comes. We keep that clarity of thought." And what if Everton come calling? "I just keep going on with my job." Kyle: Awful game and disappointed to lose as neither side did enough to win it. Terrible advert for Premier League football. 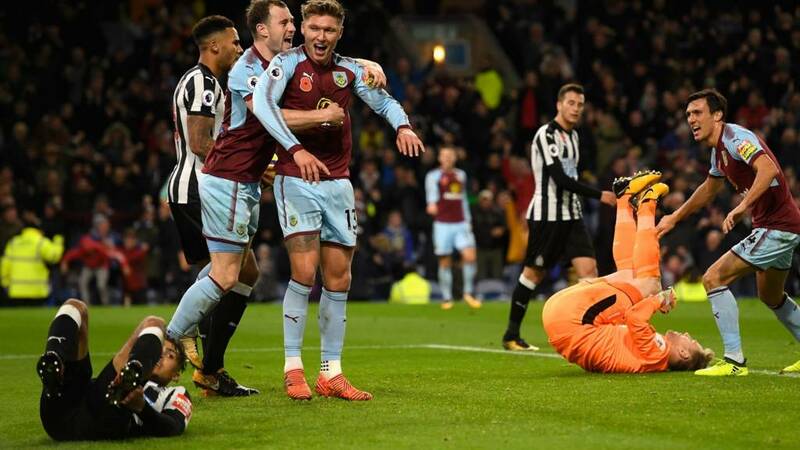 Kris Jefferson: Burnley really well drilled, but Newcastle were so so poor in the final third, barely any creativity and no final ball. Thomas Hollern: Burnley level with Liverpool and only three points behind Arsenal and Chelsea. That's pretty good for a so called ''small'' team. Newcastle manager Rafa Benitez: "It was a game we were controlling and we knew that scoring one goal would win it. We made a mistake and we paid for it. "It was two teams who know what to do and little details could make the difference. We had nine attempts in the second half, we thought we could win the game. We were not precise on the ball and we have to improve. "We know our strengths and our weaknesses. We have to improve on everything but I am happy with our work rate." Frank Lopez: As a Toffee, Id love Dyche but he'd be stark raving mad to trade this Burnley into our mess of a squad. Here comes Sean Dyche. 'Margins are tight.' he correctly says. Burnley goal scorer Jeff Hendrick on Sky Sports: "Watching the clips on Newcastle they've been tight and hard to break down. We kept working hard and got the goal in the end. I was just hoping the lad missed the ball and I had an open net then - if I had missed that I think I'd have gone off. "Sean Dyche has us working hard every week and the bare minimum is to give your lot. We've scored some great goals this year and we need to continue that." Burnley have conceded nine goals in 10 games. You can't argue with that. To be able to compete against top-four teams, you have to work out how not to concede. That becomes a set-up. That might lead to not many goals at Turf Moor, but that's how Burnley are managing to pick up points. Burnley midfielder Jack Cork: "We knew they take risks on the ball, they play out and we knew we could nick it from them. That's where the goal came from. "I'm tired now, we work hard and cover some ground. You can see that we are a team evolving. Sean Dyche has been great for me. he's a man who wants hard work and honesty at all times." Rafa Benitez will probably say we 'didn't deserve to lose', but his argument can't be that they deserved to win. You can't expect to get anything from the game when you're so poor. Tonight shows how difficult it is to be a football manager, there was nothing between these two teams. Both sides made a lot of mistakes, but Burnley took their real chance. Sean Dyche trudges off a hero, Rafa trudges away. Three more points for Burnley. Burnley go seventh. Jonjo Shelvey's cross is good, Javier Manquillo flicks it on - over! These types of games can really make your season. Can you get three points when you don't deserve it, or don't play as well? Save! Isaac Hayden whistles in a shot from 20 yards and it's really well saved! Rafa Benitez goes to sit down. Nothing more he can do now. His side have improved ever so slightly since going behind but Dwight Gayle can only head tamely on goal from 16 yards. Fantastic from Ashley Barnes. We know what he's capable of- we haven't seen enough of it tonight.